Angulimala, the robber and murderer, is one of the best known figures of the Buddhist scriptures, because of his dramatic life story. His conversion to monkhood and later to sainthood was exceptional as he seems to have been the only former criminal to be accepted into the Buddhist monastic order. The Buddha had often warned not to judge people from appearances and their external behavior. 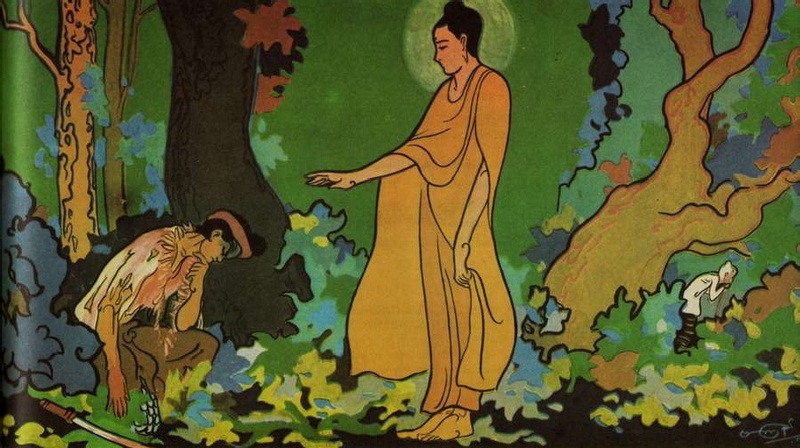 In Angulimala’s case, the Buddha had seen his hidden potential to win freedom, not only from his present low moral status and from rebirth in the lowest worlds of painful existence, but that Angulimala would also be able to gain the highest freedom from all suffering in this very life. At the Buddha’s time, at the court of King Pasenadi of Kosala, there was a learned brahman called Bhaggava Gagga who held the office of a Royal Chaplain and was thus one of the kingdom’s highest dignitaries. One night his wife, Mantani, gave birth to a son. Soon afterwards, the father cast the boy’s horoscope and to his consternation found that his son was born under the “robber-constellation” of the planets. This indicated that the boy would have within him a tendency to commit robbery. One can well imagine what the father must have felt when confronted with that shocking and unexpected revelation. On the day of the child’s birth, there was another disquieting event: all weapons and armory in the city of Savatthi had suddenly begun to sparkle. To further this aim, the boy was called Ahimsaka, which means “Harmless.” When he grew up, he was quite well behaved, and unusually strong in body. But he was also studious and intelligent. So his parents had good reason to think that any evil dispositions in their son had been removed by a good education, and by the religious atmosphere of the home. This made them, of course, very happy. In due course, his father sent Ahimsaka for his traditional studies to Takkasila (Taxila), the ancient and famous university of India. He was accepted by the foremost teacher of that seat of learning, and he continued to be so studious that he surpassed all his fellow students. He also served his teacher so faithfully and humbly, was of so pleasant speech and conduct, that he soon became his teacher’s favorite. He even received his food from his teacher’s family. And this made his fellow students very jealous: “Since that young Ahimsaka came, we are almost forgotten. We must put a stop to it and cause a break between him and the teacher.” The well-tried way of calumny was not easy as neither Ahimsaka’s studiousness nor his conduct and noble ancestry gave an opening for denigrating him. “We have to alienate the teacher from him and thus cause a break,” they thought; and so they decided that three groups of people should approach the teacher at intervals. The teacher probably expected that Ahimsaka, in his attempt to complete that deed, would be killed himself or, being caught by the king’s men, would suffer the highest penalty of execution. Perhaps the teacher may also have secretly cast Ahimsaka’s horoscope, seen from it his latent propensity to violence and now tried to incite it. Faced with such an outrageous demand, Ahimsaka first exclaimed: “O Master! How can I do that? My family never engaged in violence. They are harmless people.” — “Well, if the science does not receive its due ceremonial homage, it will yield no fruit for you.” Now Ahimsaka consented and, after worshipping his teacher, he left. The stories of old on which this present narrative is based do not tell us what had moved Ahimsaka finally to accept his teacher’s macabre demand, without any further and stronger protest. One of his motivations may have been that an unquestioning obedience to the guru appeared to him as the first duty of a pupil, this being an echo from his earlier way of life that was governed by higher principles. But the stronger factor in his decision will probably have been that his hidden dispositions had actually emerged in his mind when vistas of violence were evoked by his teacher’s words. He may have felt attracted by a life of violent adventure as a challenge to his manly prowess. So, in his final response to his teacher’s demand, he did not even think of the alternative, to gather the fingers from corpses thrown into India’s open charnel grounds. Instead he equipped himself with a set of the fivefold weaponry, among them a large sword, and went into the wild Jalini forest in his home state, Kosala. There he lived on a high cliff from where he could observe the road below. When he saw travelers approaching, he hurried down, slew them and took one finger from each of his victims. But a mother’s heart is soft, and out of love for her son, she set out alone for the forest area where Angulimala was reported to have been hiding. She wanted to warn him and save him, and to implore him to renounce his evil life and go back with her. At that time Angulimala had already gathered 999 fingers, and only one more was needed to complete the 1,000, the target set by his teacher. To bring his task to an end, he may well have killed his mother when seeing her on the road. But matricide is one of the five heinous offenses that have an irreversible and immediate result. They lead to rebirth in the lowest hell. So, without his knowing it, Angulimala, as it were, was close to hell’s rim. In this situation — it was in the twentieth year of the Buddha’s teaching career — the Master, in surveying the world, became aware of Angulimala. To the Buddha, with his faculty of remembering former existences, he was not unknown. In many lives they had met before, and often had the Bodhisatta conquered Angulimala’s strength of body by his strength of mind. Once Angulimala had even been a close relative of the Bodhisatta, his uncle (Jat 513). When this was said, the Blessed One went on in silence. For a second and a third time those people warned him. Still the Blessed One went on in silence. Angulimala, from his look-out, saw first his mother approaching. Though recognizing her, still the thought arose in him to complete the thousand fingers by killing her. So steeped was his mind in the habit of killing without scruples. At that moment the Buddha appeared on the road between Angulimala and his mother. Seeing him, Angulimala thought: “Why should I kill my mother for the sake of one finger when there is someone else? Let her live.” So he was still moved by merely seeing his mother, though he was not aware that she had gone that hard road out of love for him. To forsake getting his mother’s finger was, of course, made easier for him when he saw another figure, that of a monk, approach. He did not know, however, that it was a similar offense against the most sacred in life to kill an ascetic, a monk. He was only concerned with completing his thousand fingers. Now Angulimala took up his sword and shield and buckled on his bow and quiver and he followed behind the Blessed One. Angulimala, who, as a warning to himself, had kept his notorious name, was now being introduced into the Dhamma and instructed in a monk’s conduct. Not long afterwards, the Enlightened One, together with a large number of monks and with Angulimala as his attendant monk, set out to wander to Savatthi, which was Angulimala’s home territory, and he arrived there in stages. The people of Savatthi, however, did not yet know about Angulimala’s great transformation, and they complained that the king had hesitated too long in sending out an army detachment to track and capture Angulimala. Now, King Pasenadi himself at the head of a large group of his best soldiers, set out towards Angulimala’s haunts, the Jalini forest. On his way he passed the Jetavana Monastery where the Buddha had just arrived. Since for many years he had been a devoted follower of the Buddha, he stopped on his way to pay his respect to the Master. But it happened that, as soon as Angulimala had taken up going on alms-round, people fearfully ran from him and closed their doors. So it was in the outskirts of Savatthi where Angulimala had gone first, and it was the same in the city where Angulimala had hoped he would not be conspicuous. He could not get even a spoonful of food or a ladle of gruel during his alms-round. The Vinaya (Book of Discipline) records (Mahavagga I.41) that some people, seeing Angulimala in robes, resented it and said: “How can these recluses, the monks of the Sakya scion, ordain a notorious criminal!” Monks who heard this told it to the Buddha who then proclaimed the rule: “Monks, a notorious criminal should not be ordained. He who does ordain such a one commits an offense of wrong-doing (dukkata).” There are similar cautions in the same section of the book. The Buddha knew well that, though he himself was able to perceive any existent potential for good in a criminal, those after him might not have that capacity, nor the authority to carry out whatever they understood. An acceptance of former criminals might also cause problems to the Order, if misused as a safe shelter by unrepenting criminals who wanted to escape arrest and punishment. In response to that new rule, some people may have changed their attitude and gave alms to Angulimala when he stood before their door. Yet there was still a mood of hostility against him with most of the people, and Angulimala realized the futility of making alms-round in his home town. Still, dutifully, he continued. Angulimala’s noble birth, or spiritual rebirth, began with his ordination as a monk and culminated in his attainment of sainthood. Angulimala had it announced to that woman that he would be coming. People there put up a curtain in the woman’s room, and on the other side of the curtain a chair was placed on which the monk was to sit. Now Angulimala, having arrived at the woman’s house, made the asseveration of truth as Buddha had told him, and there was soon a safe delivery for mother and child. Thus he who had destroyed so many lives was able to give life and well-being to others. For that reason, this episode must have deeply moved him. He also saw that Samsara was infinitely more cruel, being an incessant process of dying and being reborn only to die again. Generally, the Buddha did not engage in “raising the dead” or in “spiritual healing.” He knew that those revived would still die one day. His was the greater compassion when he showed to beings the true state of Deathlessness and the way to acquire it. But why did the Buddha make an exception in the case of Angulimala, and instruct him to use the power of truth for the purpose of healing? Here is a reflection by the teachers of old, the commentators: There may be those who ask: Why did the Blessed One make a monk do a physician’s work? — To that we answer: That is not what the Buddha did. An act of truth is not a medical function; it is done after reflecting on one’s own virtue. The Blessed One knew that Angulimala had wearied of collecting alms-food, because people were frightened when seeing him, and ran away. To help him in that situation, he let Angulimala do an act of truth. People, namely, will then think: “Having engendered a thought of loving-kindness, Angulimala Thera can now bring safety to people by an act of truth,” and so people will have confidence to go near him. Then Angulimala will no longer be wearied of collecting his alms food and will be fit to do a monk’s work. Until then, namely, Angulimala had not been able to focus his mind on the basic meditation subject which he had received, though he tried day and night. Before his mind’s eye had appeared the place in the jungle where he had slain so many people. He heard their plaintive voices imploring him: “Let me live, my Lord! I am a poor man and have many children!” He saw the frantic movements of their arms and legs when in fear of death. When faced with such memories, deep remorse gripped him and made him get up from his seat and leave. Therefore, the Blessed One let him make that act of truth about his noble birth, expecting that Angulimala would then take his birth as something uncommon, and, strengthening his insight (vipassana) would attain to sainthood. So it was for these reasons that the Buddha made an exception by asking Angulimala to perform that act of truth. And for these two reasons, too, that episode proved to be of great help to Angulimala. For that help, Angulimala showed gratitude to his Master in the best way possible: by perfecting the task set by the Buddha, the attainment of sainthood (arahatta). Dwelling alone, withdrawn, diligent, ardent, and self-controlled, the venerable Angulimala, by realization himself here and now entered upon and abided in that supreme goal of the holy life for the sake of which noble sons rightly go forth from the home life into homelessness. He knew directly: “Birth is exhausted, the holy life has been lived out, what was to be done is done, there is no more of this to come.” And the venerable Angulimala became one of the arahants. He was now reckoned among the eighty eminent arahants and most of the people had now full confidence in his inner transformation and that his earlier name, Ahimsaka, the Harmless, fully befitted him. Since the episode with the ailing woman, there was also no lack of support when he went on alms-round in Savatthi. Yet there were still a few who could not forget that Angulimala the bandit, with his superior prowess, had shown them in their weakness and thus had humiliated them. Out of that resentment, as an act of revenge, they were mean enough to injure the venerable Angulimala by throwing stones and sticks which struck him when he had gone for alms. They must have done so from a safe distance. Being a saint, his mind and heart were firm and invulnerable. But the body, the product of former craving, the symbol and fruit of previous kamma, was still there in present existence and was still exposed to the effects of former evil deeds. Even to the Buddha himself it happened that, as a result of former deeds, Devadatta was able to cause him a slight injury. Also his two chief disciples had to experience bodily violence. The venerable Sariputta had been hit on the head by a mischievous demon, and the venerable Maha-Moggallana was even cruelly murdered. If this occurred in the case of these three Great Ones, how could Angulimala have fully avoided bodily harm — he who in his present life had committed so much evil! Yet, it was only his body that received these blows, but not his mind. That remained in invulnerable equipoise. He, as an arahant, was also in no need of consolation or encouragement. Hence we may take the Buddha’s words in the sense of reminding Angulimala of the kammic concatenation of the law of sowing and reaping. There is no other record about Angulimala’s later period of life than what himself said in the verses which follow. These tell us that he lived in such solitary places as forests, caves, and mountains and that, having finally made the right choice in his life, he spent his days in happiness. And happily I spend my life. On both sides high and purely born. 1. The commentary says that Angulimala spoke the verses 874-876 after he had been injured during his alms-round.